Come for the rides, stay for the award-winning dishes – with a whopping 40 percent off the price of admission for a limited time, too! There's more to Hong Kong's own Ocean Park than the awesome rides and the pandas, and their new Gourmet Tour is the proof in the very delicious pudding. 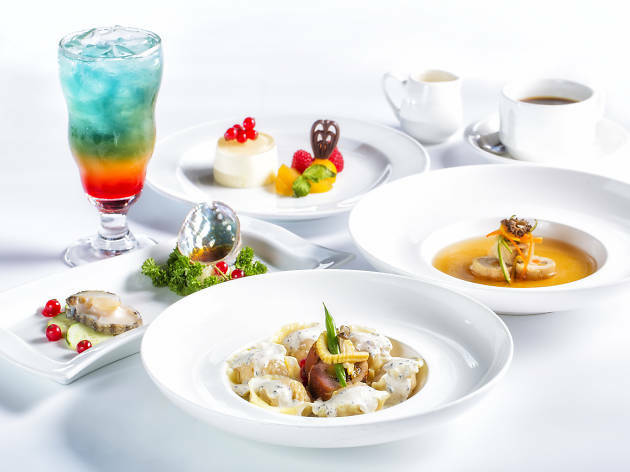 The just-launched Gourmet Tour is a showcase of the Wong Chuk Hang amusement park's award-winning culinary offerings. As a launch special, you can score a whopping 40 percent off your admission and the dishes on offer with a Gourmet Tour Delicacies Combo ($650 for adults, $350 for children). The park's Neptune's Restaurant and Tuxedo Restaurant are offering specially designed menus featuring sophisticated dishes in the most spectacular of settings – Neptune's is located right next to the Grand Aquarium, while Tuxedos gives you a chance to dine alongside penguins! Start your culinary journey with abalone with pomelo and soy vinaigrette before moving on to a wild mushroom consommé and chicken roulade. Finish on a high with the stunning champagne mousse with caramel apple, winner of the 2014 Gourmet Master Chefs Gold Award. A wine pairing menu is also available, exclusive to Neptune's. Dishes on this six-course feast include scallop ravioli with truffle cream sauce, and contrasting of prawn and lobster with apricot and almond. 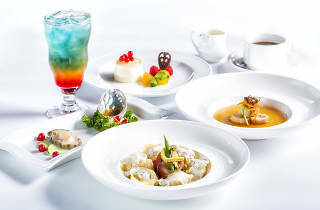 As well as fine dining, Panda Café and Café Ocean are also joining in the culinary fun. Look out for adorable panda-shaped pork croquette with crispy rice and seaweed, itself a category winner at the 2015 Best of The Best Culinary Awards organised by the Hong Kong Tourism Board. There's truly something for everyone at Ocean Park this season. With award-winning dishes, spectacular rides overlooking the South China Sea, and a taste of old Hong Kong with traditional street food, Ocean Park is a guaranteed great day out for all the family. For more information, head to http://bit.ly/2eQC8ex.